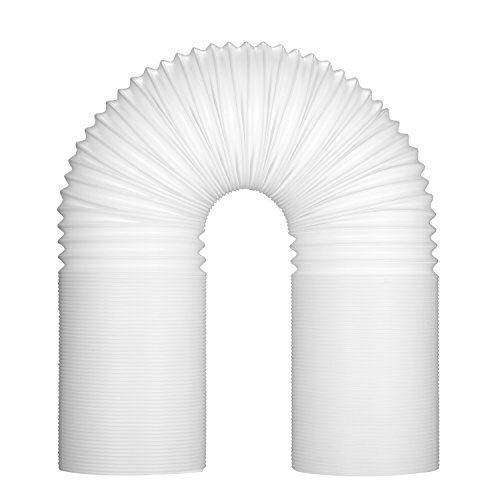 The air exhaust hose is made by polypropylene with good flexible, fits to various portable air conditioner models. It is a good replacement when the essential vent hose has cracked. 1.The hose diameter is 5 inch/ 13 cm (outer edge to outer edge), please confirm the models of air conditioner to make sure the size is compatible before purchase. 2.The direction of installation is counter clockwise. ECO-FRIENDLY PP MATERIAL: Flexible and durable air exhaust hose extension or replacement when the essential vent hose has cracked. Anti-corrosion, toxic-free. STRETCH AND SHRINK FREELY : The air hose is designed extendable, the shortened length is about 20 inch, extendable up to 78 inch, stretch and shrink freely the length of the exhaust hose. GOOD COMPATIBILITY: The diameter of exhaust hose is 5 inch/ 13 cm, fits to various portable air conditioner models. EASY INSTALLATION: Gently extend out the exhaust hose to meet up with the existing hose, line up with the both ends, snap into place. Just rotate the hose anticlockwise to complete the installation. WARRANTY : Please confirm your air conditioner hose diameter is 5 inch/ 13 cm (outer edge to outer edge)before purchasing. We provide 30 days return guarantee and 12 months warranty. Love it or your money back. If you have any questions about this product by Fitfirst, contact us by completing and submitting the form below. If you are looking for a specif part number, please include it with your message.